The new film from Academy Award-nominated filmmaker Tamara Jenkins (The Savages, Slums of Beverly Hills), Private Life is the bracingly funny and moving story of Richard (Academy Award-nominee Paul Giamatti) and Rachel (Kathryn Hahn), a couple in the throes of infertility who try to maintain their marriage as they descend deeper and deeper into the insular world of assisted reproduction and domestic adoption. After the emotional and economic upheaval of in vitro fertilization, they’re at the end of their middle-aged rope, but when Sadie (breakout newcomer Kayli Carter), a recent college drop out, re-enters their life, things begin to look up. 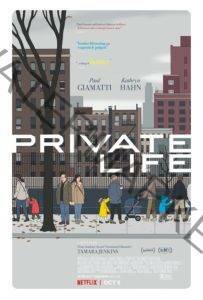 If you like what read about Private Life, please remember to share Netflix New Releases on Facebook, Twitter or wherever you guys want it’s all appreciated.